This is the finished cake, warm and waiting to be cut. 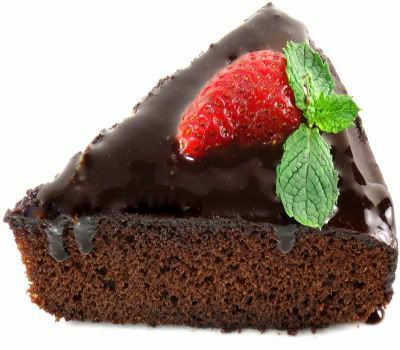 A single slice of this delicious, but different chocolate cake. Light olive oil is lighter only in color and taste. It is not a diet version of olive oil. From the kitchen of One Perfect Bite...This cake is unusual in its simplicity and the ingredients that are used to make it. It's flavored with unsweetened cocoa, olive oil and lemon zest. It's a great family dessert and because it does not require an electric mixer, the youngest members of the family can help make it. Light olive oil, seen in the picture above, is lighter in color and flavor than regular or extra-virgin olive oil, so it's perfect for baking certain desserts and dishes in which the taste of olive oil is not desired. It can be purchased in any well-stocked grocery store. This cake tastes best when served warm. It should be glazed just before serving. I hope you're willing to experiment and give this cake a try. You will not be disappointed. 1) Preheat the oven to 350 degrees F. Grease a 9-inch springform pan or a deep 9-inch round cake pan with light olive oil. Set aside. Unusual but I'm sure it's yummy. What a beautiful picture. Any thing mediterranean...I am so there. Yummy cake! Is Zach helping you as well? This WILL be the next chocolate cake I bake. I love olive oil cakes. Thanks for sharing. 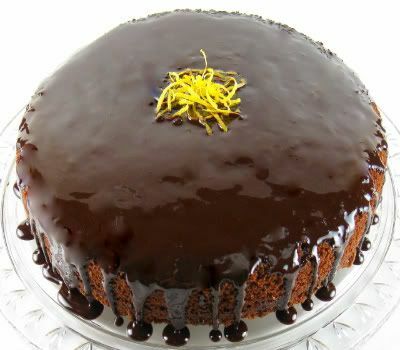 I must say that although I already make a chocolate cake using olive oil, I have never seen it used in the glaze. How fascinating. Perhaps that's why the glaze has such a lovely sheen. Terrific photo. Mary-The picture with the lemon zest is beautiful. It is an unfamiliar combination to me, but I love lemon and imagine that it is a good addition to anything. I may have to give this a try! Oh my goodness! Your cake looks extremely inviting! I also really like the way you let the chocolate icing to flow freely on the sides. Very beautiful! What a delicious cake. I have made a blueberry olive oil cake that is delicious. Olive oil really does work so well in cakes. I will try yours. Thanks for the recipe! What a most beautiful picture of the cake. How intriguing are those ingredients. The chocolate cake totally looks delicious! That cake looks so delicious, I love your recipes, you are an amazing cook I can tell! Sounds different with the light olive oil. I love chocolate and I adore lemon so I will bookmark this one for my cooking club. Thanks for sharing. Love this idea! It looks so beautiful! Lovely pictures adn it looks soo mouth watering! Your picture made me frool, and it's only 8 am! Sounds and looks wonderful. Thanks for sharing. Have a happy day! yummmy! I love chocolate cake and this sounds so delicious! I've been wanting to try an olive oil cake for a while now...your's looks delicious! Have a joyous day today. Wow, this looks and sounds absoulutely wonderful. I have become intrigued by olive oil in sweet baking and will think of this the next time I need to bake a cake. MLS, Zach is, indeed, helping. His younger brother Drew is helping me make cookies this morning. I have always wanted to try an olive oil cake, looks delicious! I love cakes without butter! This looks fabulous. I bet this was a very moist cake. Gorgeous pictures! Your photos are amazing! This cake is right up my alley with loads of chocolate. Looks wonderful. Unusual, but interesting and very beautiful. The chocolate glaze and lemon zest create a lovely cake. I'm so curious, I have to try this one. I have long been intrigued by olive oil in a cake. The picture of yours convinces me I must try this. It looks so good. Those shots are so cool! It's like the cake is floating! Such a pretty cake--it sounds unique and good! It looks amazing and sounds delicious! 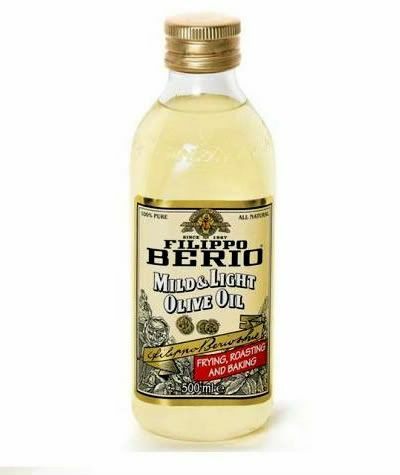 I've never seen Light olive oil actually. Will keep an eye out for it! I use olive oil in almost all my baking. I'm not sure why, but I'm emotionally attached to doing so. This cake looks wonderful Mary, but I just wonder who gets to eat all your amazing food! That looks DIVINE... I guess it would be good with a glass of lemonade! THough I prefer my chocolate with a glass of red wine... YUM! Terrific shot of your cake! I have used olive oil in other baked goods but not a cake. This recipe sounds delicious! You make such beautiful food. It would be a I hope to see you at Crock Pot Wednesdays at diningwithdebbie.blogspot.com this week. Mr. Linky is up and ready for you. to be seated at your table. Great pics and I'm always a sucker for food with unusual ingredients. Looks beautiful. Oh my goodness - this looks amazing Mary. I love the dripping frosting. Fabulous looking cake. I really like the addition of lemon and olive oil. It keeps things interesting! I've been following your blog for some time, and I love how simple you make "complicated" dishes become. This is another great example. Can't wait to try it.